Zach Galifianakis is sort of an underground jack-of-all-trades kind of guy�part actor, part comic, part writer�whose mainstream success has always been a level or two below where it really deserves be. Hardly a household name, in fact with a name that is mouthful on its own. Even with appearances in a handful of feature films (Bubble Boy, Corky Romano), appearances on Jimmy Kimmel and Comedy Central, and assorted voice parts it was a supporting role on the canceled-too-soon Tru Calling as Eliza Dushku's dry morgue boss that probably gave him his widest exposure, for a brief while at least. 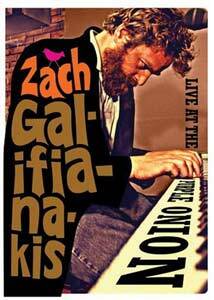 With Zach Galifianakis: Live At The Purple Onion, it is his distinctly discordant and untucked standup side that takes precedence in a one hour performance recorded over two nights in June 2005. It's funny, off-balance, inventive stuff, but this is hardly the usual series of tightly polished jokes we see with most comics, instead it's like Galifianakis wandered up on a stage by accident. Part of the time he's slumped over a piano, doodling around on the keys while he slides out assorted throwaway one-line gags ("My brother has ADD, but he drives a Ford Focus") or stares blankly into the camera, then he wanders around the small stage with the same kind of unpredictable movements�sometimes lying down completely�as his act appears to be a series of random floor scrapings of thoughts and observation, with no clearly defined set direction. The content flows rather haphazardly, as Galifianakis occasionally gets distracted by an audience member or two, milking the interaction for spontaneous laughs with comments that range from anger to simple conversation. He'll throw out another solitary line that won't go anywhere ("That show Amazing Race, it is about white people?") before launching into longer, more drawn bits about his personal life. At times it's like watching a rehearsal, with time spent discussing what the DVD should be called, or botching a few joke setups. The sense of as-it-happens comedy is what Galifianakis' act is all about, and while some it truly goes nowhere, much of the material seems purposeful in the it is so unsystematically funny. Like a scattershot burst of shrapnel. For the DVD, the stage act is periodically intercut with prerecorded interview segments conducted by NPR's Brian Unger, who talks with the fictional twin Seth Galifianakis (Zach in character, minus his beard). Seth is a nervous, fey Southern type, and like the core of the real Galifianakis' act, the character is a bundle of strange ad-libs and meandering little stories, including an on camera request to have his face hidden and voice digitally scrambled. These bits are more enjoyable than the handful of short on-location bits that also pop up periodically on this disc, offering up Galifianakis and his rotund pal Joe as they hang out, shop for on women's clothing, etc. The jilted pacing of his live act is fairly unique, and Galifianakis seems to treat the unraveling of each performance as something new and singular. Or at least he presents it that way, in a manner that seems natural and believable. Either way, it's a conversational skill set few comics seem to possess, and watching someone able to work and navigate a room seemingly without a rudder�and stay in control�is exciting to watch. That he can be so funny just makes it that much better. Image Transfer Review: Presented in 1.78:1 anamorphic widescreen, the transfer runs a little dark depending on the segment, but generally sports clean, defined edges, even during the club sequences, where lighting is rather minimal. Colors are warm and fleshtones look very natural. Some modest grain, but nothing terribly obtrusive. Audio Transfer Review: Two audio choices, either 2.0 stereo or Dolby Digital 5.1 surround. Neither is particularly noteworthy, though both do deliver generally clear voice quality, with Galifianakis' meandering humor coming across discernible most of the time. Crowd sounds are somewhat more expansive in 5.1, but either choice will deliver the weird funny equally well. Extras Review: Extras here feature a gaggle of assorted Galifianakis material of varying quality, from the strangely uncomfortable but funny Awkward Slapping Bit (03m:48s) where an audience member becomes the focus of the comic's desire to be slapped, to the rather pointless Zach Shaves (01m:52s), where we see him shave his beard in order to portray his twin brother Seth. Outtakes From Brian Unger's Interview With Seth Galifianakis (11m:16s) isn't much more than a gag reel of sorts, while the vaguely titled More... (12m:01s) is a hodgepodge of performance and on-location bits, such as visiting the Michael Jackson trial. A few Shout Factory trailers conclude the supplements, with the program cut into 9 chapters. Galifianakis lazily uncorks with some quirky, guerilla-styled standup, offering odd, out-of-nowhere observations with a jazzy, off-the-cuff smugness. His approach and pacing is far the from the norm for most standups, and this performance presents the comic doing what seems like a genuine stream of consciousness.